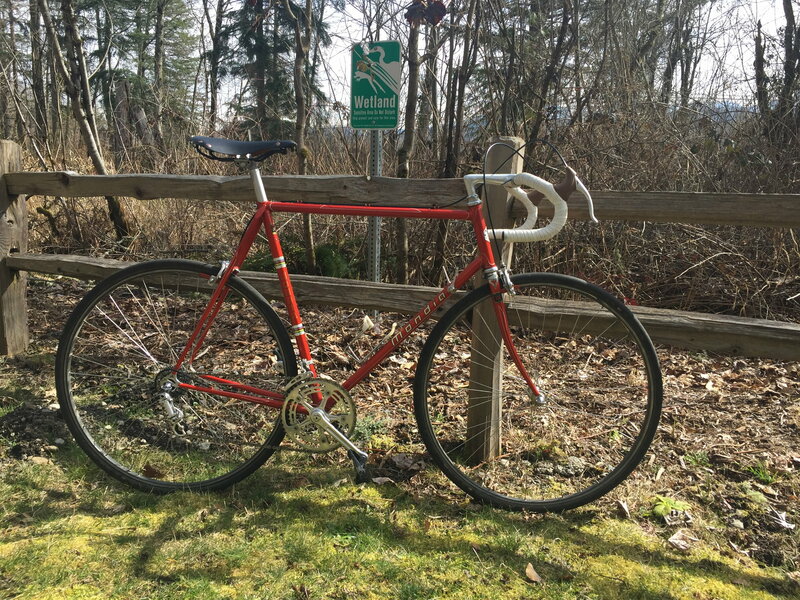 So I was looking at another forum, and someone posted a great vintage bike. Setup pretty typically for that era - in terms of saddle height vs handlebar height. A: slamming a quill stem looks unbalanced. What do you think about the slammed threads? 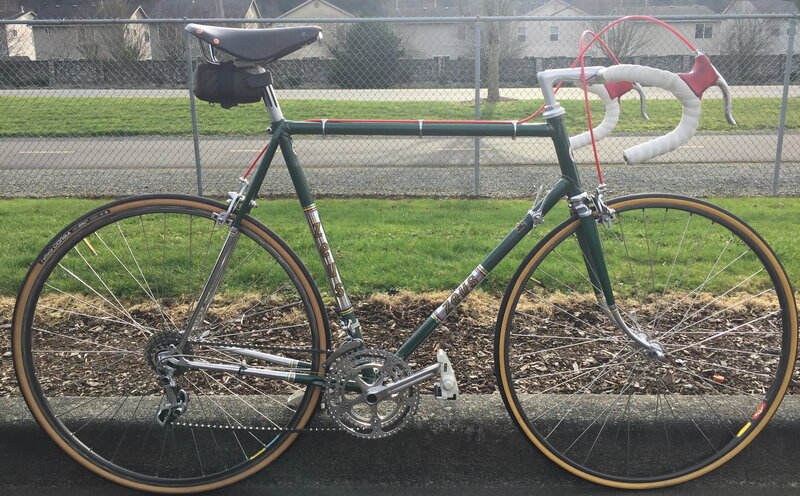 I don't know whether I'm just a particularly disproportional human being, but for me a slammed stem with a correctly-sized classic frame would require straight or riser handlebars instead of drops. B: I think they look good if the stem is long enough and has an angle between -17 and 0 degrees. A short slammed stem or one that has a positive rise just looks weird. "Slam that stem" is an in-joke among roadies, some of whom think a bike looks more "pro" when the stem is lowered as far as it can go. I wouldn't concern myself with it. Last edited by ThermionicScott; 04-13-19 at 10:18 AM. 1- Making ones body a more efficient push through the air. 2- Affects handling, weight distribution and center of gravity. Unless one is racing, it really doesn't matter to 99.9 percent of cyclist. Most seek a balance of comfort and aero. Funny thought. There's a video of cycling blokes testing a fat gut vs being trim and affect on aerodynamics. These are 2 with stem lower than most of my others. Are these stems ‘slammed? Depends on frame size and mostly headtube length, doesn’t it? On a 58cm frame with shorter headtube , I get this look. Last edited by Wildwood; 04-13-19 at 10:39 AM. The only way to go lower would be a more negative angle on the stem. Depends on frame size and headtube length, doesn’t it? Nope. And I hear he was pretty fast. 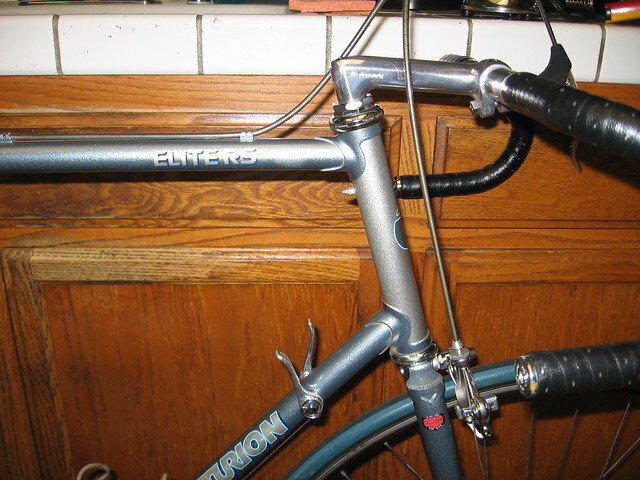 People really did not slam stems during the level top tube era, at least not all the way. If you wanted a more aggressive position, you went for a longer stem, a smaller frame, or deep drop bars, or all three. Or maybe you moved your levers slightly below the plane of the drops, like some Italian pros. Wildwood's examples are about as low as anyone went. i usually cannot get a quill to ‘slam’ because it won’t insert any further. I agree with poster who said it’s mostly a phrase ‘Slam that stem’. I thought it only applied to threadless set-ups - until this thread. 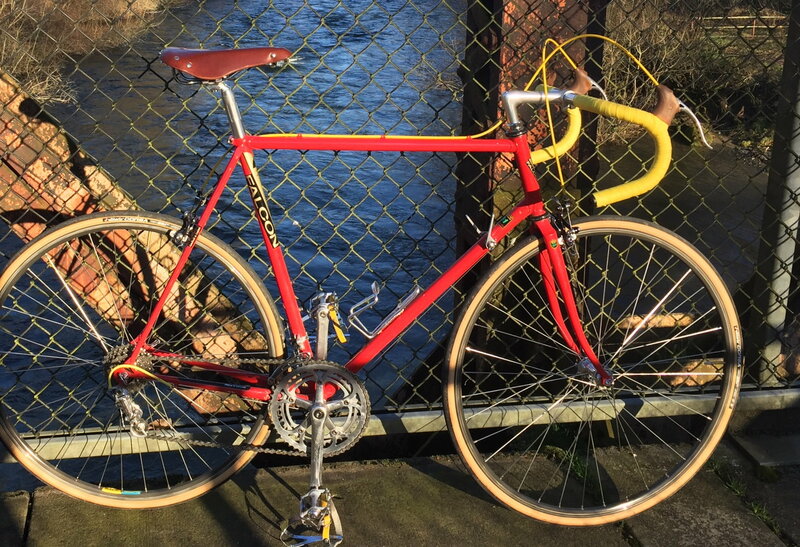 That's applying modern aesthetics to vintage bikes. Nobody would have done that. If you showed up for a club ride, you'd have been laughed at, and then probably dropped on purpose out in the boonies. Think yer fast, do you? Obviously that bike isn’t that fast it’s blue. Needs to be red. Stem's pretty long too. Unless the rider has a very unusual morphology, the frame's probably too big and/or they're not very comfortable . Need a pic that shows full bike to actually know anything. That stem later (after that picture) was actually more than slammed. I first shortened the steerer, I then used a modified top nut and removed/swapped parts so that the cut steerer was flush with the top of the thin, re-worked locknut, then used grease to "seal" the area where the quill enters the steerer. But that's not all! I further added an inside radius to the end of the steerer, only toward the front, just enough to allow a few mm further lowering without the steerer or nut notching into the stem. The photo above is actually the BEFORE photo, I took another couple of photos after the completed modifications, and shown below. Not sure why I went to all of the trouble, just that I really wanted to go out and do some hard riding on that bike. I guess that last-gen Shimano New 600EX friction-shift drivetrain seemed too good to just flip onto the market, it was the most current/advanced friction setup to be released prior to the arrival of SIS, and remained in the lineup even after 600 SIS was brought out. So ironic, the original stem is a full-length Technomic, I haven't even re-wrapped the bars so it's still on there! The work was mostly a success, the fit on the bike is pretty good but the bike does have a somewhat high front-center distance from the bb to the front axle, meaning that drafting a lead rider has the tire a little closer to the lead rider's tire. I've added pictures for clarity. Last edited by dddd; 04-13-19 at 11:47 AM. I dunno. Slam this one and let's see what it looks like. that was a "thing" for a while. Last edited by Chombi1; 04-13-19 at 02:08 PM. That stem later (after that picture) was actually more than slammed. 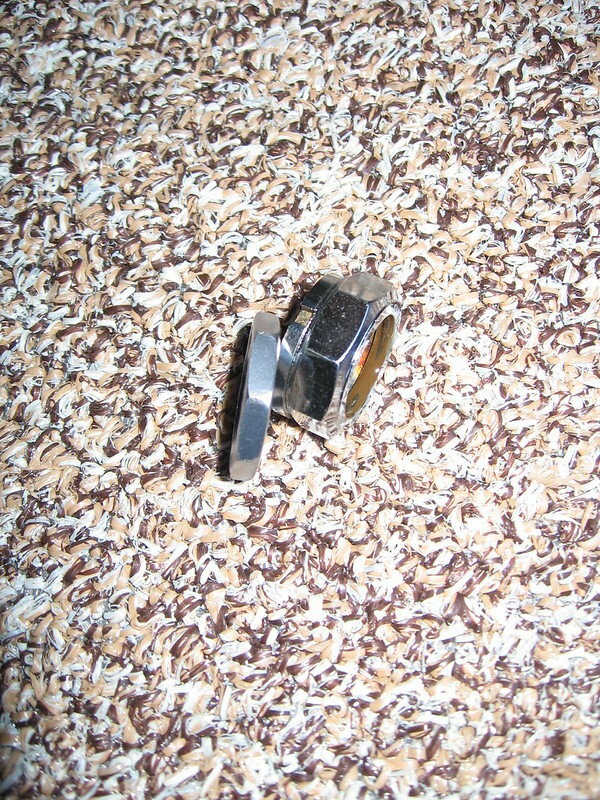 I first shortened the steerer, I then used a modified top nut …….. But that's not all! I further added an inside radius to the end of the steerer, only toward the front, just enough to allow a few mm further lowering without the steerer or nut notching into the stem. 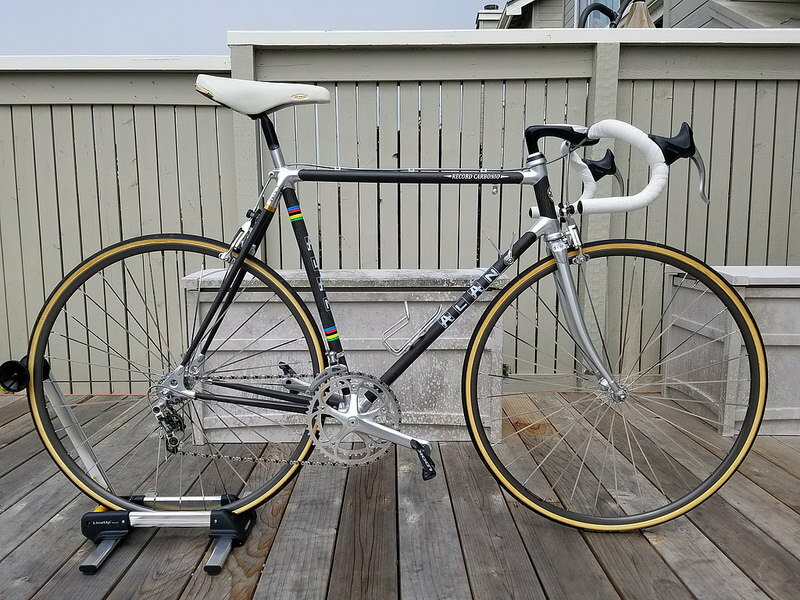 I can totally understand slamming a stem on a large frame that is comfortable, but has a tall headtube when a lower position is desired. 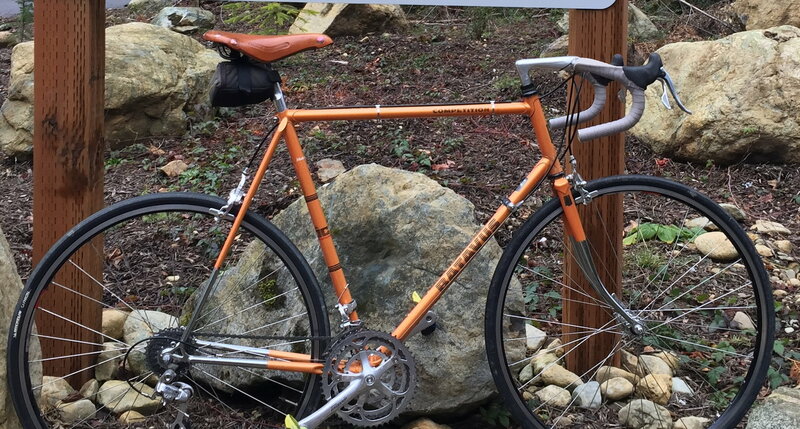 That was my situation with a big '72 Raleigh SuperCourse (25"?) with a headtube above 20cm. Could have benefitted my aero position, even with a 14cm stem. Yikes. Do that on a tapered headset with most quill stems and the wedge won't grip properly. Ah, I missed the followup post where @dddd explained that setup. 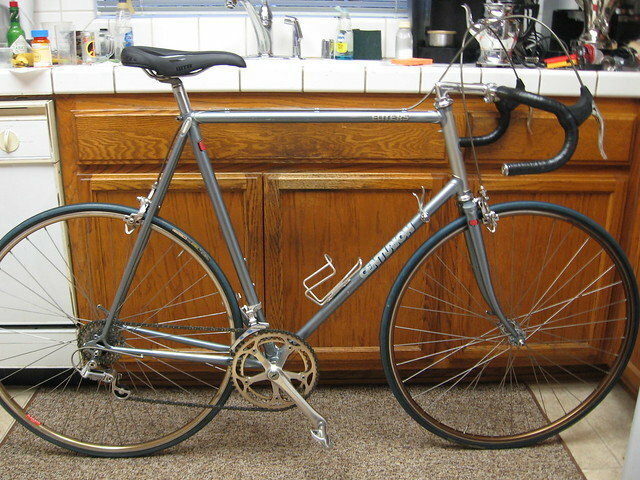 Classic steel road bikes were set up differently. In some photos of Jacques Anquetil you can see he's riding a frame slightly too large for him. He's more stretched out but with relatively little handlebar drop from the saddle. Suited his strength as a time trialist. And it suited his toe-down pedaling style, although he must have needed to sit more heavily in the saddle to manage that unique pedaling style. Reportedly he experimented with lots of crank arm lengths, from much shorter to much longer than average. My Ironman and Univega are just on the upper margin of being my size. I can straddle them but just barely -- especially the Univega with fatter tires. But I like 'em that way. I'm a little stretched out but don't need much bar drop. The new-to-me Trek 5900 is a little smaller than the Centurion, and even with a long stem it has a comfortable reach. But it has a lot more handlebar-saddle drop, although it's not quite slammed and probably never will be. It's comfortable enough right now. It's just different, not better or worse. I'd need to be a lot stronger and faster to see any real difference in my average times/speeds due to the aero advantage. I may have noticed some difference on a long slog into a headwind incline the other day. As @texaspandj told me, it rides like an Ironman, just lighter. 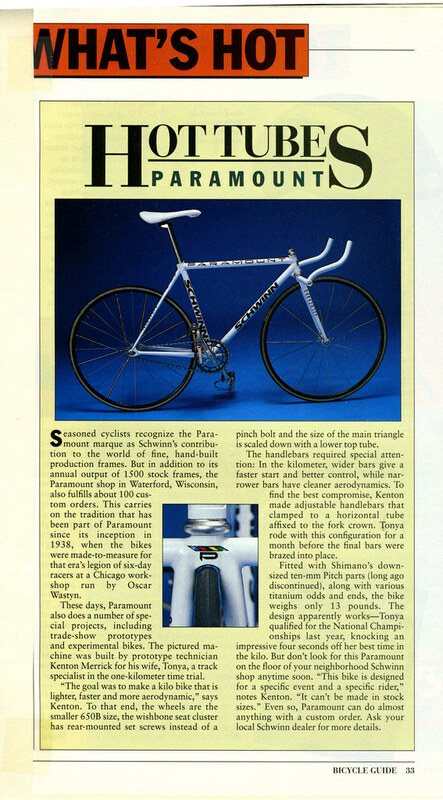 Looking back at photos and videos of Lance Armstrong on the Trek 5900 and 5500, it appeared he also preferred a slightly larger frame for a more stretched out position, without an unusually low handlebar relative to saddle height. I'm guessing this goes back to his earlier experience as a time trialist in triathlons. I notice in watching GCN videos some cyclists, including Simon, one of the presenters, some riders of more modern bikes prefer a somewhat smaller frame and shorter top tube to reduce the reach (and weight), with much lower handlebars. They'll choose a stem to balance out the two. Last edited by canklecat; 04-13-19 at 10:34 PM. That makes sense now that I see the whole bike. Perfectly reasonable riding position, and cool customizing to get there. Sorry, I wasn't trying to dis it, just conveying the prejudices and prevailing views of 'cool' WRT the setups of years past. 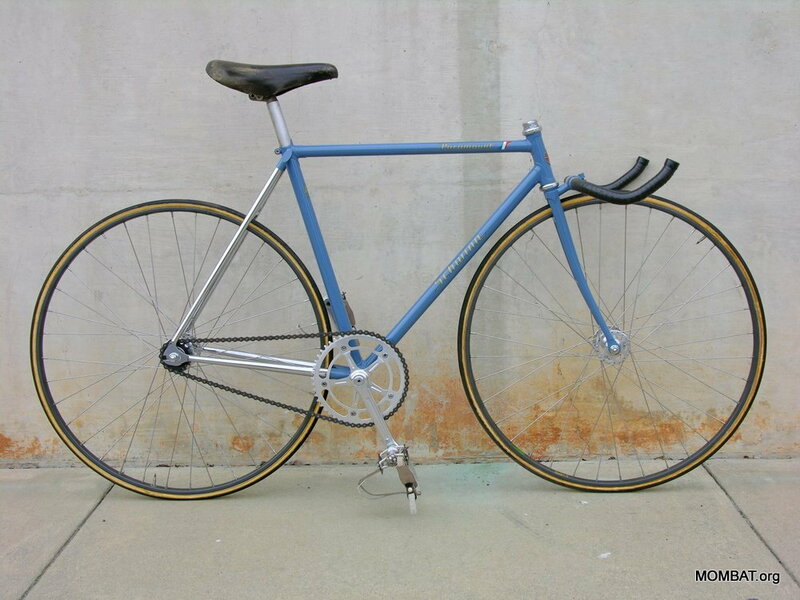 Various equivalents of slamming your stem certainly existed BITD too. 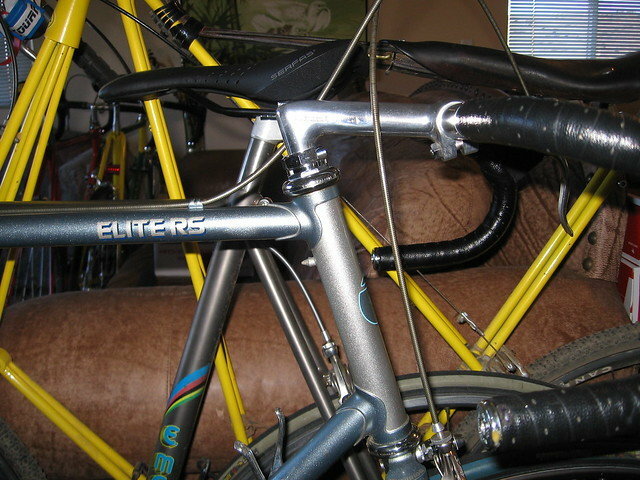 Generally if one chose a larger frame, it was to be more comfortable and get the bars up higher. If you wanted a sort of moderate typical 'race' position like above, most would have chosen a smaller frame. RE the OP: Slamming your stem is cool because that's what pro racers do. IMO it doesn't really make sense for a recreational rider. It certainly doesn't make sense on a vintage bike (with some exceptions, as in above). There were several things that changed in bike design that allowed "slamming" to make any sense at all. Top tubes slope up now, rather than being level, and therefore the stem doesn't need to go as high anymore to get the bars where they need to be. Secondly, brake levers have slowly migrated up almost a couple inches to be level with the tops of the bars. They used to be about halfway down to the drops. Also, dropped bars are not as dropped as they used to be. 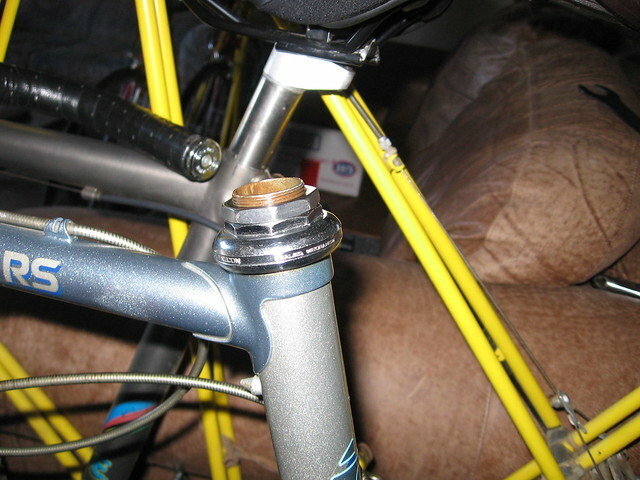 Lastly, threadless steertubes and stems have made it inconvenient to adjust bar height. It's easier for race mechanics just to cut the steer tubes all the same and maybe swap out a stem if the rider want to adjust height. Quills look funny (to me) slammed. but the bike has to fit that way, or it's just a look. Sometimes, when converting a threaded steerer/stem to a threadless setup, there is not a lot of steerer to work with. The "balanced" appearance really depends on the fit just happening to be right. I always chuckle to myself due to this issue when I scroll thru the 'hot or not' thread in the road forum. It's an entertaining thread in a similar way to how trashy reality tv is entertaining- it's completely vain and superficial. As a result, a ton of bikes have comically slammed stems and just look uncomfortable as all get out. Its funny how I don't ever see that style of setup when riding...not even when riding amongst 10000-20000 people each day on RAGBRAI. Its as if that style really isn't comfortable, unless the frame design has a built in stack height that effectively sets the bars up to a typical position. to each their own though. Some like bars to point at the crank and brake levers to be way up high. Some like riding frames thst are too small and use technomic stems to compensate. Many of us have bikes set up that arent...traditional. I really do get a kick out of seeing bikes with a slammed stem and an inch of spacers above the stem. Thats a bike that more often than not will have its bars set higher after the beauty shots are taken.